Heather and I have decided to sell our home in Dallas, Texas, buy a 5th wheel and a truck, and hit the road for a few months. We have a 12 year old daughter, and two dogs, so the first part of the adventure will likely be seeing how efficiently we can use the 350 square feet we’ll be sharing. It’ll be cozy, no doubt. How are we able to do this? Well, we think “home” has evolved, or is at least evolving. Home traditionally means owning a residence (or renting), in a good neighborhood, close job (and the subsequent commute), good school, and so on. These are all the result of choosing a place to settle in. More on “place” in a minute. The fact of the matter is that Heather and I have chosen to unschool our daughter, so she doesn’t have a bell to answer to. Neither of us have “jobs” that require us to be in any specific place at any specific time. The only thing we require is internet access. She plans vacations (specifically around the Mouse), and I built and run a product called inboundgeo. We’re told our entire lives, by well meaning people of course, that the way you win in life is to go to college, get a good job, meet someone, get married, have kids, buy a home, retire, and live happily ever after. Well, that’s cute, and not at all the way life works out. 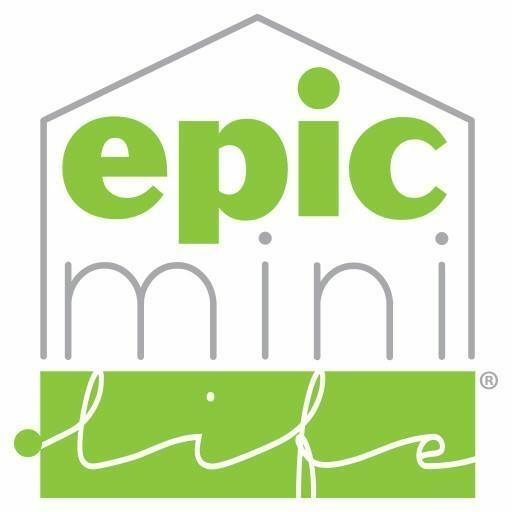 Epic Mini Life is our way of showing you how to live smaller, lighter, and with far more intention than most anyone you’ll meet. We went from 3,400 square feet to 1700, and now to just 350. It’ll cost less to operate, have a far smaller ecological footprint, and most importantly, we’ll be living our lives the way we want… today. Not when we retire. By significantly reducing your spending, paying off debt, and being mindful with your goals, you can live a truly remarkable life. It doesn’t take a 30 year career to be able to do the things you want. Not anymore. Welcome to Epic Mini Life. This is our lives… a living vacation… and we hope you’ll follow us on the journey. We’ll start with a trip to Denver in early May, and hope to “land” in Florida in August. Then the next version of Epic Mini Life will launch. Stay tuned. P.S. We’ve since done a Facebook Live video session, with some basic Q&A. Have a look when you find a few minutes. What an incredible blessing! I wish you guys the very best and will keep up with your “living adventure.” It’s inspiring, educational and real…bon chance! The road ahead is full of opportunity. Open your mind to the possibility of universal forces at work that you cannot currently understand, or see, with your current knowledge of how things work. Learn the language of the world. Listen to The Alchemist by Paulo Coelho on audio. Grow. Explore. Change. Accept. And finally, try an experiment for 21 days ….each day thoughtfully consider three simple things you’re grateful for, three people that mean something to you, and three outcomes you’d like to see. As always, and in ALL-WAYS, I wish for your family peace, love, and joy in all that you are and do. Can’t wait to follow the Sitarzewski-saga as it unfolds. Much love. Exciting! Have fun and enjoy the ride.